It’s party season! You’ve got your cheery attitude and you’re ready to belt out some carols. But, oops – what about a little something for your host? If hostess gifts tend to be an afterthought for you, we’ve got an elegant and simple solution. Skip the unimaginative box of chocolates or (yet another) bottle of wine. Give your host the gift of health instead. We know you’ve always got c on hand (if you don’t, your local grocer should have plenty). 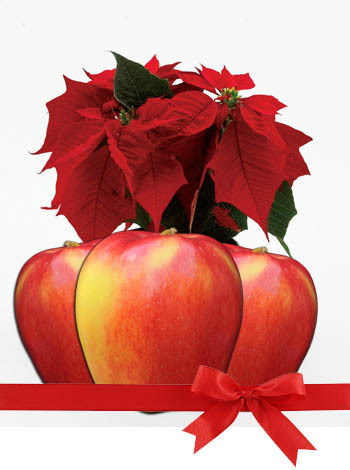 Here’s how you can transform half a dozen apples into a present the receiver will truly appreciate. Pick your six best looking Ambrosia apples. Look for good bi-colouration (a little pink and a little yellow) and a nice uniform shape. Give them a good wash and polish them with a dry cloth to bring out the shine. This will make them look irresistible and your host will know immediately that they’re ready to eat. Take your shiny apples and place them in a decorative basket or bowl. If your container is a bit too big, try filling the bottom with dry leaves, coloured tissue or napkins. Heck, even a few boughs from the Christmas tree will help fill in the space and make it look festive. You can keep it simple and just put a bow on this, or you can take it up a notch. We love Ambrosia apples on their own but there are so many beautiful foods that pair nicely with Ambrosia slices. Why not add these to your basket? We like to include a selection of cheeses. Some of our favourite options for pairing with Ambrosia are sharp cheddar, cumin-seed gouda, brie and creamy chèvre (all local, of course). How about adding some homemade hummus or caramel dipping sauce in a mason jar? You could also set them up for making a spicy cider with fresh spices like whole nutmeg, cardamom, cinnamon sticks and ginger. Or, how about a nice wooden cutting board and a decorative knife. This basket is starting to sound pretty impressive, don’t you think? Some people see apples and just see apples. Others see apples and their creative recipe juices start flowing. Help your friend get creative with their Ambrosia by including a cookbook, a foodie magazine or print off this free (they don’t need to know) Ambrosia Apples Cookbook. These baskets will be a welcome and fresh change from the usual hostess gifts. Even though you can pull this together at the last minute, we suggest you prepare a few in advance and pop them in the fridge so you’re always ready for that last minute party invite. Tis’ the season!